I swear I live for smoothie bowls, ever since I got myself these cute little wooden bowls I can’t stop making them. But I have to be fair, during the winter time it can get kind of cold but I still enjoy them from time to time. Like yesterday, I made my favourite smoothie bowl recipe ever. You can also call it ‘nice cream’ because it really taste like ice cream and it’s really nice ;-). Cut 3 to 4 RIPE (spotted) bananas in little pieces and freeze them overnight. The next morning you can put the frozen bananas in a blender. 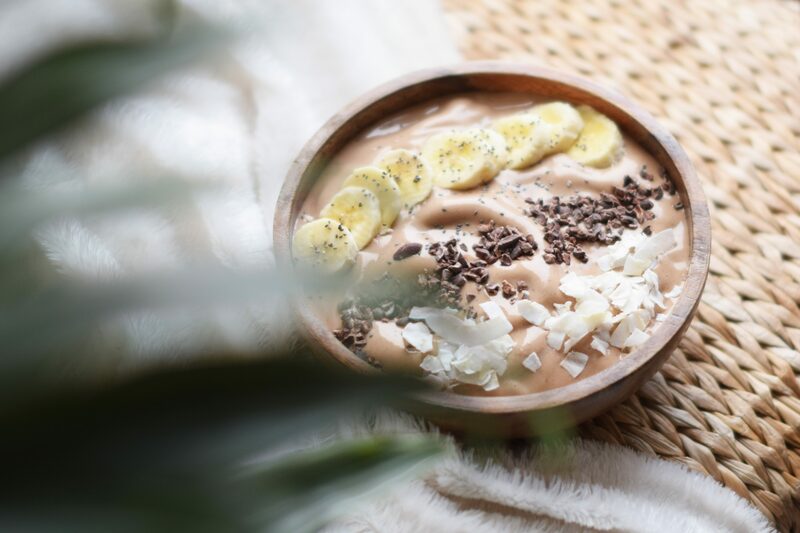 You will add 1 tablespoon of peanut or almond butter, 1 tablespoon of cacao powder, 1 teaspoon of cinnamon (or 2) and a little bit of plant based milk. My favourite plant based milk for this recipe if definitely oat milk, it just tastes amazing. Try it. After you blended everything to a nice thick consistency (almost like ice cream, not like a smoothie), you can add the fluid to your bowl and start having fun with the toppings. The toppings I usually use are shaved coconut flakes, raw cacao nibs and some chia seeds. And sometimes I like to add some more fruit like bananas or strawberries. YUM! 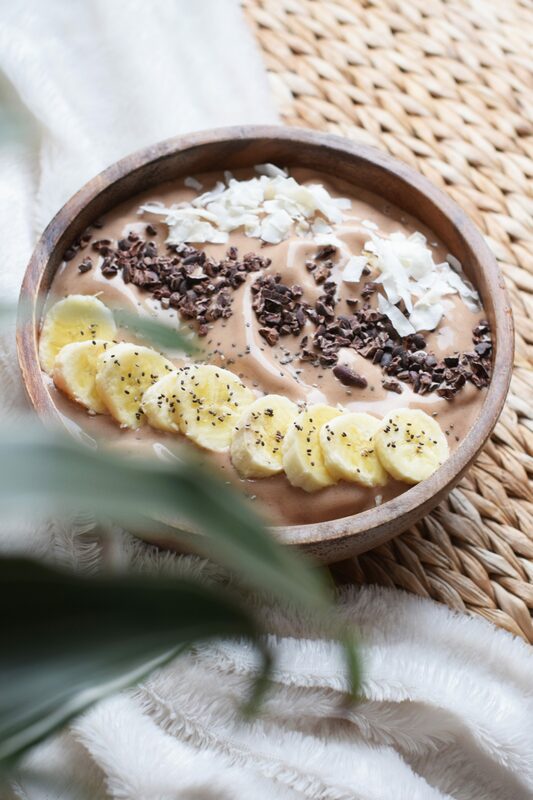 I really hope you like my favourite vegan smoothie bowl recipe and I would love to hear what you think. I am currently working on my first ebook filled with easy and yummy recipes. It’s going to be available in Dutch and English, I can’t wait to show you guys what I’ve been working on (cooking). Great that you are eating healthy….